I’ve never been particularly keen on travel tours. To me, it always seemed to involve a coach full of people who hop blearily off at each destination, take a selfie or two and then hop back on to sleep the journey away. Probably while wearing the same, aggressively ugly tour hat. After this Seoul experience, I can confidently say that food tours are an entirely different matter. I have been to Seoul before and did an exhausting amount of research for places to eat, in order to avoid the all-too-easy trap of ducking into the comfortingly familiar arms of McDonalds on foreign soil. 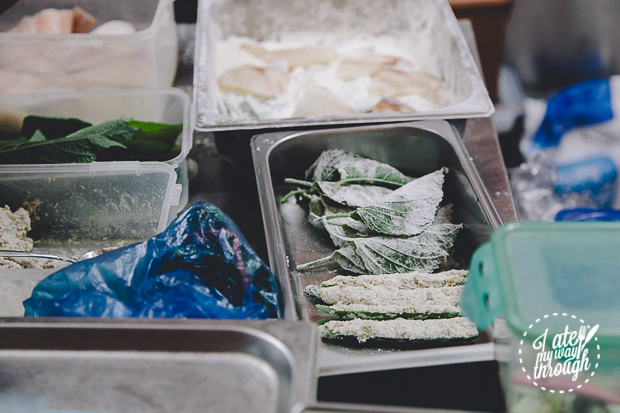 Food tours give you that local food experience without the stress of getting lost and lets you explore places you probably would never think to explore, as an ordinary tourist. Forget the hat, the coach and the selfie – bring an empty stomach, walking shoes and a thirst to try new things. Granted, you’ll probably want a selfie with the food. Five selfies with the food. In his ten years in Seoul, Lee from Delectable Travels has not only opened a pizza pub with his wife, he has also curated and run an entire list of unique food tour experiences for groups of all nationalities and sizes. We embarked on West Side Seoul tour, which is based around Mullae, a blink-and-you-miss-it station on the Seoul subway, Line 2. 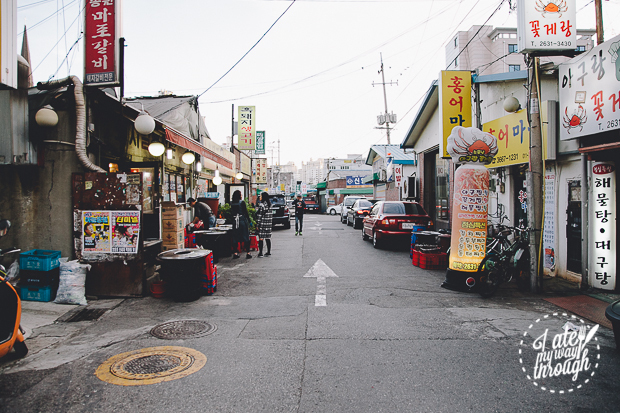 Mullae encapsulates the whole host of small, quiet suburbs that have become the go-to new homes for Seoulites moving away from the glossy malls, fashion boutiques and ancient palaces of increasingly tourism-dominated areas. 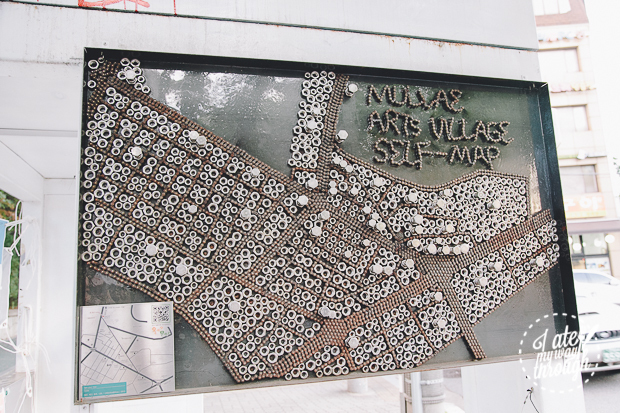 You can really see how the growing artistic community in Mullae is transforming the vibe through street art and installations, while paying playful homage to the town’s machinery and metalwork industrial history. Korean socialising, Lee tells us as we start our tour, happens in stages that are punctuated by different foods and degrees of drunkenness. The first, ‘getting to know you’ stop was to the obligatory Korean barbeque experience, at a local, family-operated eatery, where the owner greets Lee with familiar good cheer. 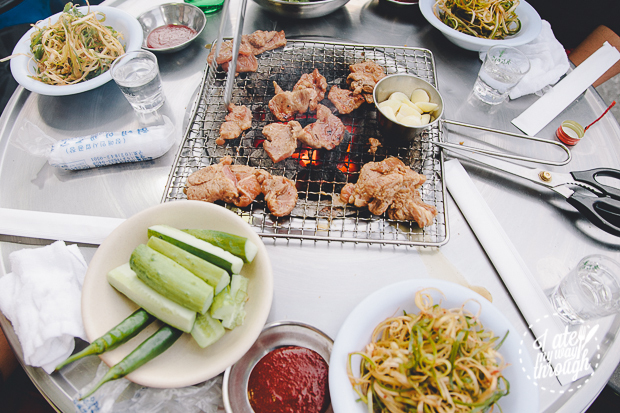 This is Korean barbeque at its most iconic and unpretentious; sitting outside on stools placed around a barrel of burning charcoal that’s topped by the grill and the distinctive, round metal tables. It’s a set-up designed for lively conversation, to the background music of sizzling meat and barbeque smoke in your face (and soaking through your clothes). The secret recipe marinade – a perfect balance of savoury and sweet flavours – is probably what’s allowed this particular barbeque place to keep running for 30 years, purely by word-of-mouth. 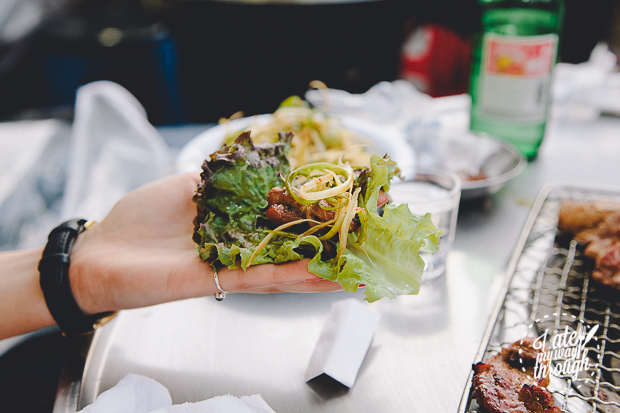 Grab your grilled meat (usually pork, beef if you’re rich), wrap it in a lettuce leaf with gochujang, cucumber and garlic, and eat without reserve. Knock back some cold soju too, while you’re at it. Bonding 101. 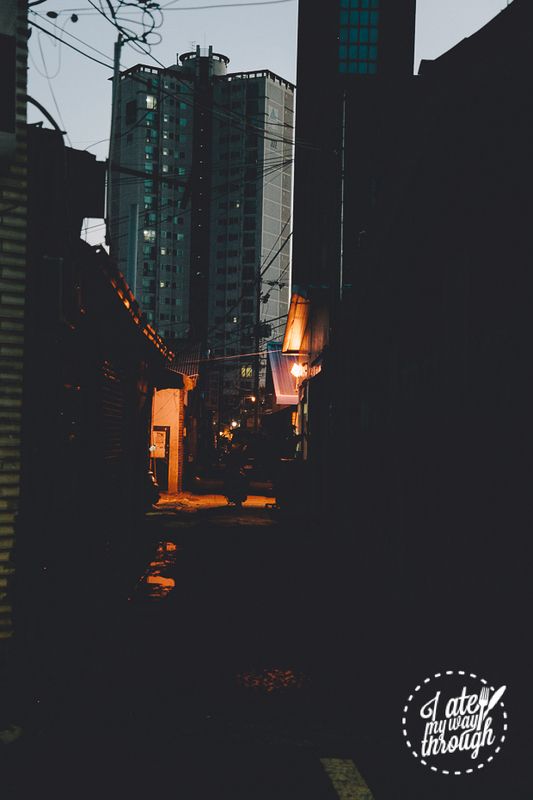 We left the barbeque place as the sky was beginning to darken and began our wanderings through the small back alleys of Mullae. Walking past dimly lit workshops and open sliding doors in the early evening, it felt a little like we had been transported to a bygone era, lit by scattered orange streetlight. The next stop was to another small, family-owned eatery hidden among the back alleys. Markers are provided if you feel the need to scribble on the walls – and it’s probably good Korean language practice to try and decipher the writing . 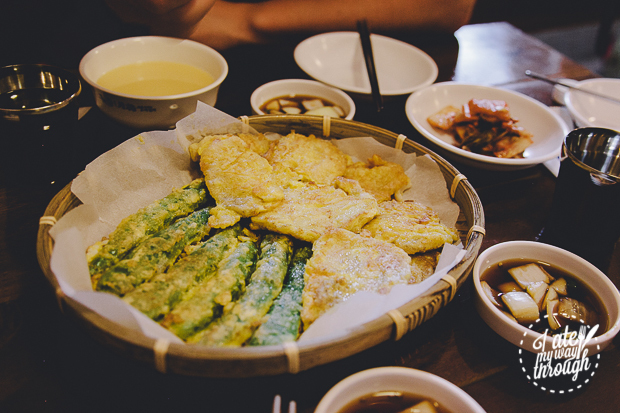 This eatery specialises in jeon, or Korean pancake, a traditional festival food. It generally involves dipping the core ingredient in egg, batter and then frying it. We ate the jeon with a special chestnut-flavoured makgeolli, which is drunk in a bowl. 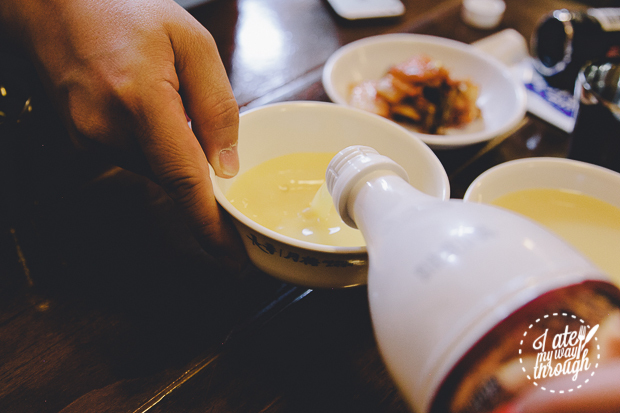 Makgeolli used to be a farmer’s alcohol and is quite sweet and milky, with a vivid chestnut aftertaste. Most of jeon we tasted were fairly lightly flavoured and are to be dipped in the special sauce that combines soy sauce with vinegar to cancel out the oiliness. The sauce is also filled with onion that has essentially been pickled, so you simply get a refreshing crunch. My favourite was probably the pollock jeon (a lightly flavoured white fish), though the more distinctive jeon filling was the green chilli peppers stuffed with pork. For those with a low spice tolerance though, beware of anything green and resembling a pepper in Korea. Beware. 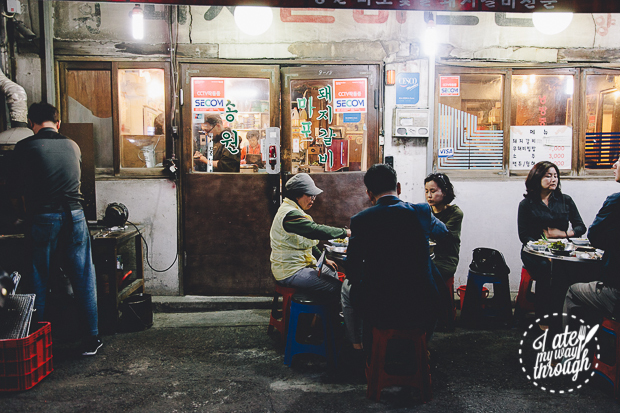 I can’t emphasis enough how great it is to talk to locals like Lee about Korean culinary traditions and the particular history of each dining venue makes the entire experience more meaningful than simply stuffing our faces. In the three hours of the tour, I think we covered topics ranging from chestnut innuendos to Korean engagement parties. Lee is extremely knowledgeable, laid back and has a way of putting you at ease, if only so he can trick you into thinking that, under Korean tradition, you’re meant to drink makgeolli like a cat (I say, watching my dining companion fall for this trick, of course). 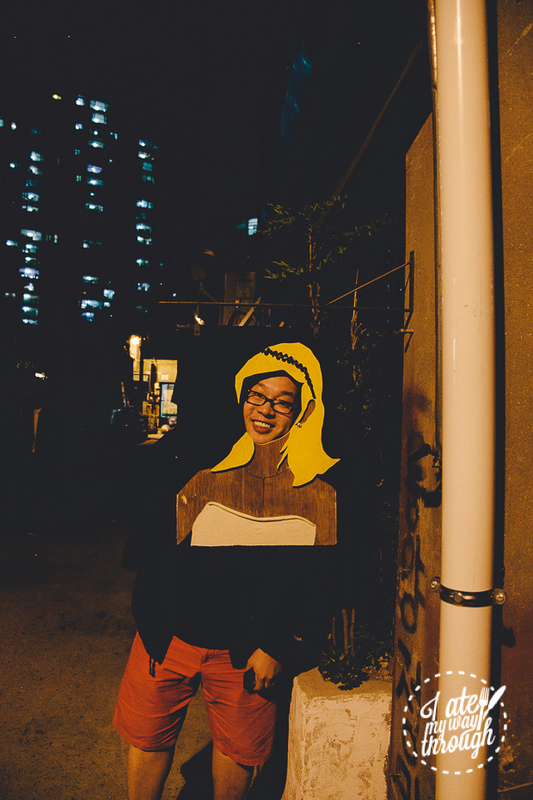 Another walk through the industrial backstreets of Mullae, filled with street art in hidden places and the glow of quiet machinery, we had officially reached the fried-chicken-and-beer (yangnyeom) stage of our socialising. 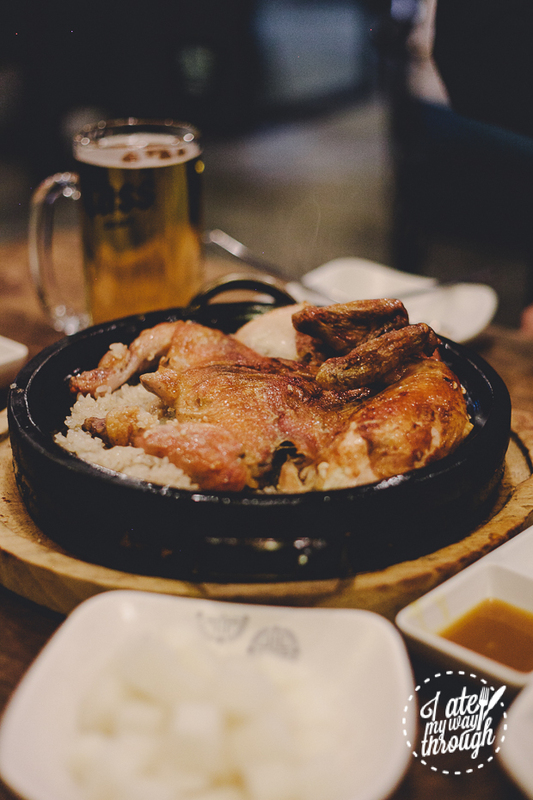 If you go to Mullae for nothing else, go for the pine-smoked chicken at Kyelimwon because it is utterly phenomenal. The chicken skin is fried twice and is therefore melt-in-your-mouth crunchy, without as much oiliness or heaviness. The taste is fragrant, lightly salted and brings out the natural, slightly smoky flavours of the meat. The dish is served on a hot plate on a bed of brown rice, mixed with some glutinous rice for extra chewiness. The hot plate cooks the bottom layer of rice into nurungji, which is what Koreans call the crunchy, slightly scorched bits of rice that gets stuck to the bottom of the plate. You have really not known food heaven until you eat the tender, smoked chicken meat with the nurungji slightly burnt bits of rice stuck to the bottom of the plate. Of course, in Korean fried chicken eating tradition, the meal is not complete without beer and pickled, sweet white radish cubes. Funnily enough, Kyelim is located opposite one of the only remaining red light districts in Seoul, a fact that didn’t seem to perturb the young families who were also dining at Kyelim. For a red light district, it’s really low key, with just a tiny bit of seediness to keep you on your toes. 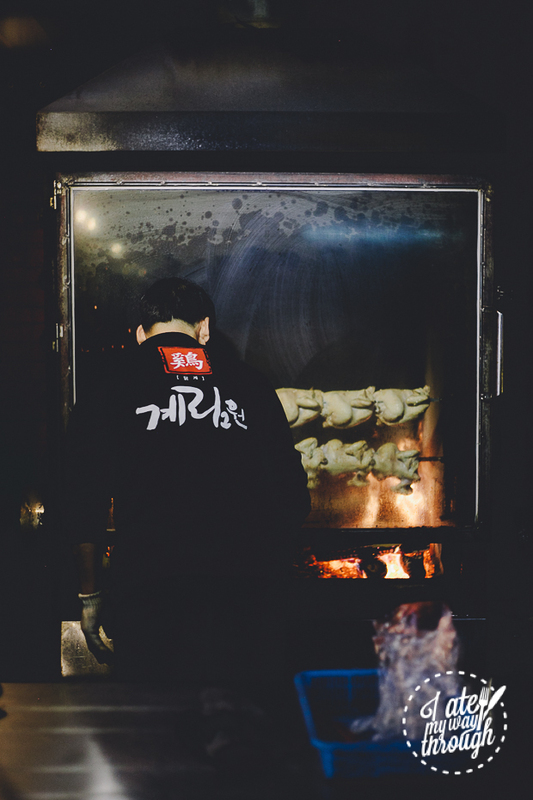 We finished up the food tour near the Singil Station area, where the streets get busier, the lights get brighter and the streets are filled with neon-signed restaurants and food carts selling your usual Seoul street food affair. For dessert, Lee introduced us to a particular hotteok street vendor, whose food truck, again, is a long-standing local fixture. 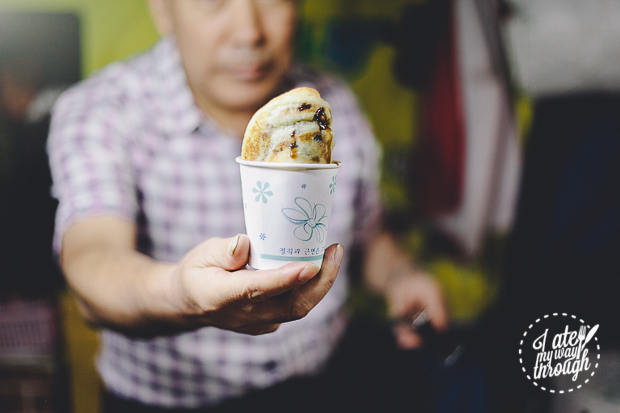 Hotteok, a sweet pancake, is a popular Korean street food. Ours was generous with its filling of brown sugar syrup, cinnamon sugar and walnut (not peanuts, which street vendors often use to save money). It’s a sweet, chewy snack that’s great on cooler nights. The biggest worry I had about food tours was whether visiting so many places in the one evening would be too overwhelming. 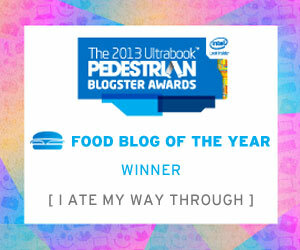 I ended up being surprised at how much I ate without feeling too stuffed. 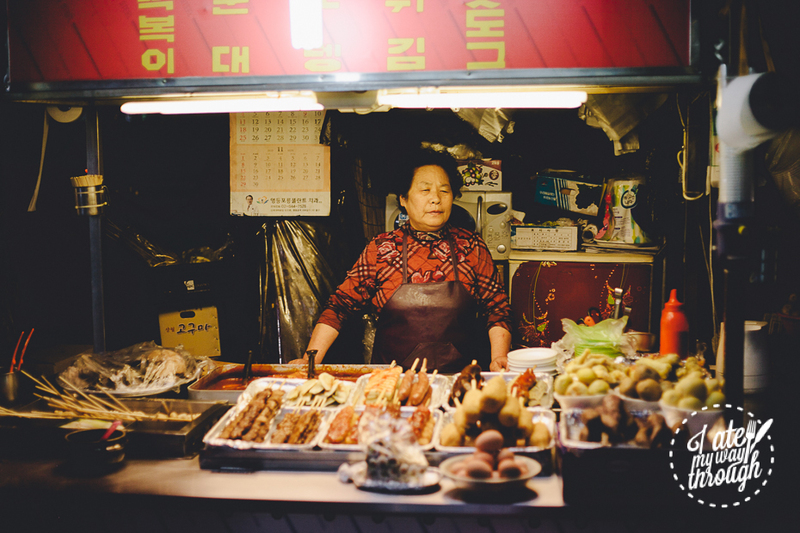 The fact that the West Side Seoul tour was a food and culture tour made it much easier on the digestion as we would walk a fair distance between stops. That being said, skipping lunch on the day would also help. 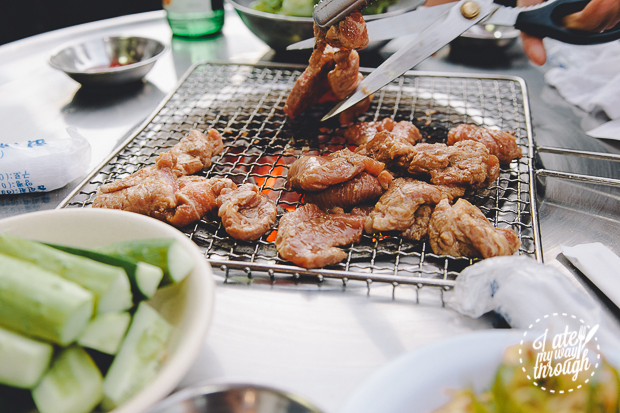 If you’re looking for a culinary experience that’s just a tad more out of the ordinary while you’re in Seoul, try the West Side Food Tour, or another Delectable Travels. After all, if you’re going to shell out on the airfare, you may as well ensure every meal you have in Seoul is a great one. I Ate My Way Through toured as guests of Delectable Travels.